ROCHESTER, Minn. – After legendary basketball coach Pat Summitt was diagnosed with early-onset Alzheimer’s disease at Mayo Clinic in 2011, the winningest coach in NCAA Division 1 history went public with her battle against the disease. 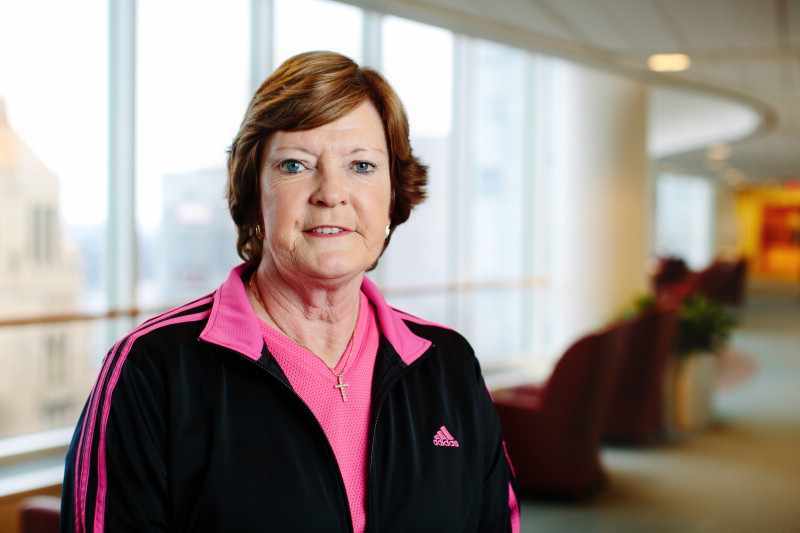 Today, Mayo Clinic mourns the loss of Coach Summitt and extends condolences to her family. Diagnosed at 59, Summitt was a tireless advocate for raising awareness, especially regarding early-onset Alzheimer’s disease, which strikes people younger than age 65, Dr. Petersen says. Some people with early-onset Alzheimer’s have the common form of the disease, and experts don’t know why they get the disease at a younger age than others do. For most, however, early-onset Alzheimer’s runs in the family. They’re likely to have a parent or grandparent who also developed Alzheimer’s at a younger age. Early-onset Alzheimer’s that runs in families is linked to three genes that differ from the APOE gene that can increase risk of Alzheimer’s in general. The genetic path of inheritance is much stronger in early-onset Alzheimer’s. People with a genetic mutation in one of those three genes — the APP, PSEN 1 or PSEN 2 — may develop Alzheimer’s before age 65. When is genetic testing needed? That’s a personal decision. Anyone who’s considering it should first seek genetic counseling to examine the pros and cons. For example, it may be helpful to consider how a positive test may affect eligibility for long-term care, disability and life insurance. For carriers of early-onset genes, understanding test results may make it easier to cope with effects of the disease. Does early-onset Alzheimer’s progress at a faster rate? There’s a perception that early-onset Alzheimer’s progresses faster, but it’s not backed by hard data. It depends on what endpoint is used in measurement. If the endpoint is admission to a nursing home, that may occur earlier for the early-onset group — but only because their spouses or partners may have more demands on their time, such as children and jobs, than older spouses do. For example, people who have early-onset Alzheimer’s may still have children at home. They or their partners may have elderly parents that need care, too. Often, people may find themselves caring for elderly parents, the loved one with early-onset Alzheimer’s and their children all at the same time. Resources are available to help people with Alzheimer’s care for themselves and function on their own as long as possible. Many resources are also available for caregivers. How important is it to obtain an accurate diagnosis? An accurate diagnosis is critical to explain the condition to employers and perhaps arrange a lighter workload or more convenient schedule. For family reasons, it is even more crucial. A diagnosis is fundamental in helping the family respond with understanding and compassion. In addition, a complete evaluation will rule out reversible forms of dementia that might improve with treatment. Journalists: To arrange an interview with Dr. Petersen, please contact Susan Barber Lindquist in Mayo Clinic Public Affairs at 507-284-5005 or newsbureau@mayo.edu.